The Indian scientific and diplomatic community mourns the passing away of Padma Bhushan winner and close friend of India, Russian scientist Guri Marchuk, who died in Moscow this week. Condoling the death of Academician Gury Ivanovich Marchuk, Indian ambassador to Moscow, Ajai Malhotra said on Wednesday that in the sad demise of the one of the prominent scientists of Russia, India has lost a highly admired friend. Marchuk died in Moscow, on Monday, after a prolonged illness, at the age of 87. He was one of the last veterans of Soviet science. Marchuk played a pioneering role in creating the bilateral Integrated Long-Term Programme (ILTP) of Cooperation in Science and Technology in 1987. “He was the first co-chairman of the flagship Integrated Long-Term Programme for Cooperation in Science and Technology between our two countries. His friendship and guidance contributed greatly to nurturing strong and mutually beneficial scientific ties between India and Russia,” he stressed. Recalling his close association with Marchuk, Malhotra said he was privileged to know him as a friend for 31 years, since 1982, and was absolutely delighted to meet up with him once again on my return to Moscow in 2011. “On this sad occasion, I would like to convey heartfelt condolences on behalf of the Government of India, the people of India and on my own behalf. Our prayers are with the grieving family of the departed soul as indeed with the Russian scientific fraternity and the people of Russia,” Malhotra said, referring to the “irreparable loss” in the demise of Marchuk. Marchuk was a key pillar of the ILTP as a scientific cooperation venture between India and the Soviet Union. The agreement on ILTP was signed on July 3, 1987 by the former Soviet President Mikhail Gorbachev and late Indian Prime Minister Rajiv Gandhi. The ILTP enabled the scientists of the two countries to undertake bilateral collaboration research in various fields, including healthcare, IT, biotechnology, laser and electronics. The ILTP was extended for a further ten years from December 21, 2010, with a new mandate to promote innovation-led technology cooperation. So far, under the ILTP, 361 projects have been implemented and another over 110 are under implementation. Marchuk co-chaired the ILTP’s Joint Council with Prof. C.N.R. Rao for 25 years and was made a foreign honorary member of Indian National Academy of Sciences. He was also internationally recognized for his scientific achievements for which he was conferred with many high awards. Marchuk’s professional career as a scientist scaled many heights. As a widely acclaimed scientist and author, he had more than 350 scientific publications to his name, covering fields such as computational and applied mathematics, atmospheric and oceanic physics and even immunology. 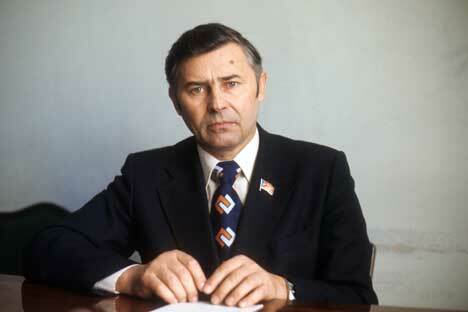 He also helped build the Soviet thermonuclear bomb and designed a liquid metal cooled nuclear reactor for submarines. In 1986, Marchuk was elected the President of Soviet Academy of Sciences, a post which he held until the collapse of the USSR in 1991. After retiring from the post, Marchuk continued his research work.